Set to be released in June, The Catholic Family Bible: Divine Mercy Edition is being published by C.d. Stampley Enterprises Inc. Totalling 1724 pages, this family Bible comes in the RSV-CE translation. If interested, there are many online book sites that have this Bible for sale somewhere in the $60 range. This beautiful edition of Stampley's "World's Most Beautiful Bible" pays special tribute to the Divine Mercy -- a powerful devotion for experiencing the mercy of God, strongly supported by Pope John Paul II and based on the spiritual writings of St. Faustina Kowalska. 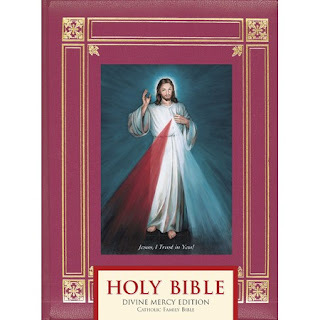 This special edition Bible includes a 16 page full color insert on the Divine Mercy message and devotion and a gold stamped burgundy cover with the Divine Mercy image prominently displayed. Additional features include sections on the Rosary and Stations of the Cross; an inspiring 48 page full color section on the Life of Christ; a "pilgrimage in pictures" to shrines and the Holy Land; Old Master illustrations of Prophets, Patriarchs, and other Heroes and Heroines of the Bible; a 16 page Family Record section on fine Parchtex Paper; deluxe side-sewn binding; gilded page edges; extensive study aids, including a 256 page Biblical Dictionary, Index and Concordance; and much, much more. Features the RSV-CE text. Matt. Check out catholic.net. In association with the USCCB they have started a bible search engine in English and Spanish. Don't see the translation they are using. I checked out this bible search engine on catholic. net, and it appears to be using the NAB, which would make sense since the USCCB was involved in this project. I'll use it for my bible study classes.